Installing APK files on Android is easy. Most of the users done this process through Google Play Store. However, users sometimes have to side load APKs manually. Usually it is accomplished using a file manager, finding the APK, and installing it. 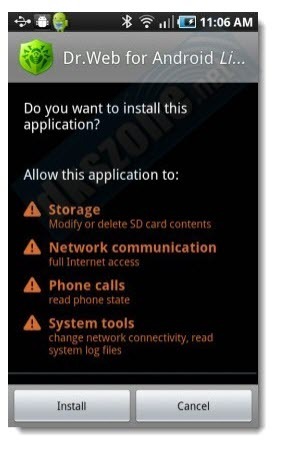 But it is a simple way to install APK files in your android device. Just drag APK files and drop into yellow zone, that’s it everything is complete. Full credits will goes to the XDA Senior Member quangnhut123 who has released this final version of APK Installer tool. 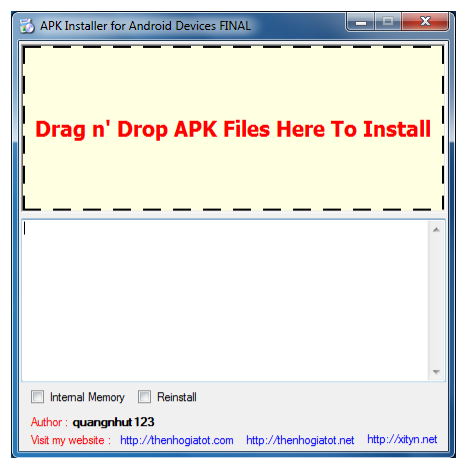 At, below we are giving the simple instructions to install the APK files in all android device. But before, that strictly follow the pre requisites. 1. First turn ON the android device, which you want to install APK Installer. 2. After that connect the device to the computer with the help of USB cable. 3. Now, Go to Settings > Applications > Tick Unknown sources. 4. Again, Go to Settings > Applications > Development > Tick USB Debugging. 5. Once, you turned on the USB Debugging and Unknown sources Run this tool on your PC. 6. Drag and drop all the APK files you want to install into yellow zone and wait till install completed. 7. Now, that’s it the program will install them without you having to install one by one. Enjoy!!!! There are two options: Internal Memory and Reinstall. a) Internal Memory : Install APK file into internal memory (phone memory not ex-sdcard). By default this tool will install into ex-sdcard. b) Reinstall : Reinstall the program that corrupted. Please make a note that this tool require Microsoft.NET Framework 3.5 on your PC to run. The downloads are available in the given below links.